IT WAS like a Cuestars Gold Tour day out in Leeds on Sunday. Five of our top under-21s had qualified for the last-16 of the English Under-18 Championship at the Northern Snooker Centre. Steven Hughes (pictured, right) described it as “a weekend that I will never forget” and Oliver Sykes (left) produced a result that will send shock waves through the upper reaches of the junior game. The previous day, Hughes, who is sponsored by Quickdraw Supplies, was able to add ‘national quarter-finalist’ to his CV. The 16-year-old beat EASB Premier Junior Tour player Reggie Edwards (Norwich) 4-3 in the last-16 of the English Under-21 Championship. It was an epic encounter lasting three-and-a-quarter hours. Hughes then lost 4-1 to England international Riley Parsons (Cannock). 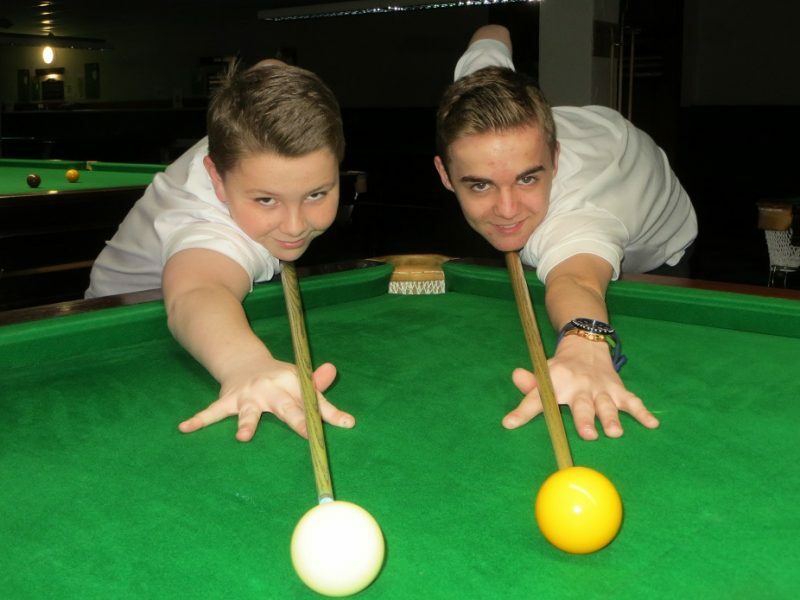 The following day he repeated the feat in the under-18s, winning three black-ball games in a 4-3 victory over Regional Junior Tour South winner Alex Clenshaw (Harlow). Hughes, who was never in front throughout the match until the final ball was potted, trailed by 52 points with 59 on in the decider. But he then lost 4-2 to Premier Tour player Hayden Staniland (Worksop). Meanwhile, Sykes recorded a remarkable 4-3 victory over 17-year-old three-time national junior champion Hamim Hussain (Birmingham), who finished fifth on the EASB Premier Junior Tour. The 12-year-old bounced back from the disappointment of missing the match-ball blue in the sixth frame to fire in a 52 break in the decider. He then went down 4-0 to Edwards. Sykes also reached the quarter-finals of the under-14 and under-16 events in February. Jamie Wilson, who lost 5-0 to Ryan Davies (near Oldham) in the final of the 2016 English Under-14 Championship, put up a hell of a fight when the par met again. The 14-year-old may have lost 4-2 but he battled well and produced some excellent safety play to give Davies, who is now in the final, a match to remember. In fact, Davies, who finished seventh on the national under-21 circuit, did not score a single point in the first frame. And Mickey Joyce lost 4-2 to Davies in the last-eight after overcoming Aidan Murphy (Bristol) 4-2. The lads earned places in Leeds via qualifying tournaments in London.